In this paper, we study the stochastic unbounded min-knapsack problem (Min-SUKP). The ordinary unbounded min-knapsack problem states that: There are n types of items, and there is an infinite number of items of each type. The items of the same type have the same cost and weight. We want to choose a set of items such that the total weight is at least W and the total cost is minimized. The Min-SUKP generalizes the ordinary unbounded min-knapsack problem to the stochastic setting, where the weight of each item is a random variable following a known distribution and the items of the same type follow the same weight distribution. In Min-SUKP, different types of items may have different cost and weight distributions. 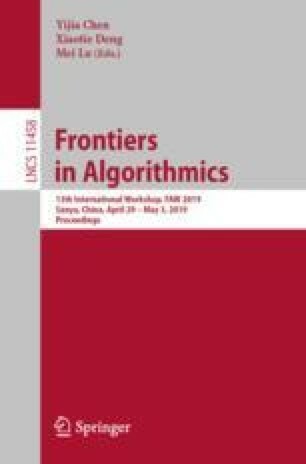 In this paper, we provide an FPTAS for Min-SUKP, i.e., the approximate value our algorithm computes is at most \((1+\epsilon )\) times the optimum, and our algorithm runs in \(poly(1/\epsilon ,n,\log W)\) time. The authors would like to thank Jian Li for several useful discussions and the help with polishing the paper. The research is supported in part by the National Basic Research Program of China Grant 2015CB358700, the National Natural Science Foundation of China Grant 61822203, 61772297, 61632016, 61761146003, and a grant from Microsoft Research Asia.